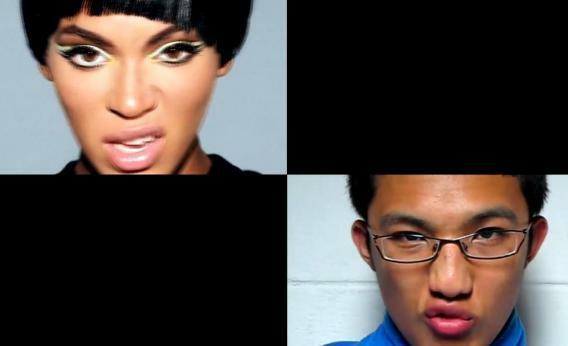 “Countdown” with Snuggies: Beyoncé’s video gets a great shot-for-shot remake. Wrapped, fabulously, in a Cookie Monster-blue Snuggie, the performer—who looks like he’s not quite out of high school—has crafted an impressive shot-for-shot remake of the pop star’s video. The editing (far superior to that of the average YouTube user) mimics the quick cuts, split-screen shots, and colorful assault of the original “Countdown,” transforming makeshift performance spaces like his basement into venues for visual splendor. And while he may not be able to hire a troupe of dancers to back him up, he can get one trusty friend to represent them all, by rolling around eagerly on the floor. His attention to detail is fascinating.